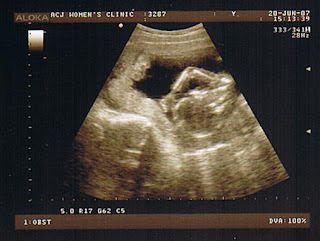 While we still do not know whether baby's a boy or girl we already had an idea on baby's name. 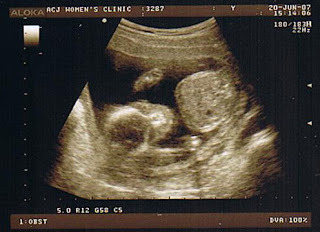 If he's a boy...then it's quite default he'll be called Elijah. It's a name Ww has already decided very long ago that he'll name his son Elijah. What does Elijah mean? it means that My God is the Lord. If you're familar with Elijah, a Hebrew prophet from the bible (1 & 2 Kings). If she's a girl, then we'll name her Elizabeth or Eliza. Actually i kinda wanted Eliza but it's a short form of Elizabeth anyway after a little research. Both names mean My God is a vow. We'll bother about that later since there's still 5 months to figure out. Next is chinese name...think hard. will prob have to get someone to help us with it....at first Ww had ideas of not giving a chinese name but i felt that chinese names can really be meaningful and beautiful. Meanwhile...baby gets active sometimes and i can feel movements. not really strong ones like kicking (maybe it is but cos baby's still so small!) 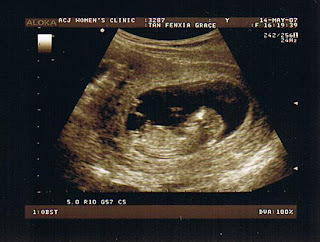 but i know baby's moving around inside like how we saw thru the ultrasound scan. Dr.Tan mentioned that an active baby is also a good sign of a healthy baby. For every mother, whether it's a girl or boy we all want our children to be healthy and well. It's been such a long time since i've gotten the energy to post anything up! so much has happened since and i've just came bac from our lil getaway in sydney (boy..i love the cold weather!). 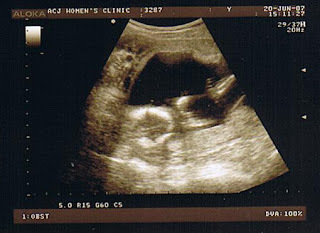 i had wanted to post the 2nd gynae appt ultrasound images for a long time but never got down to do so. 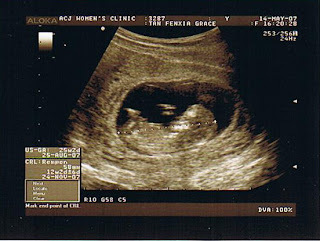 can u see baby's foot raised up? i can't remember what i had wanted to write previously but things are better now and the nausea is easing out...other than when i'm tired...which will make me throw up so it's my body's way of telling me that i need rest. i'm kinda getting used to the throwing up thing..which i'll feel better after that so i didn't really mind. 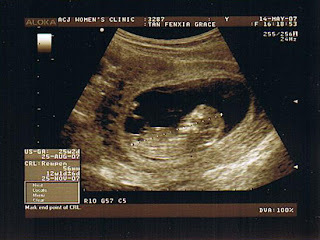 but it still scares Ww...heh..
today was our 3rd appointment with our gynae and baby's grown! it's quite exciting to see baby and i've been feeling baby's movements which aren't really strong but i know he/she's moving inside..usually quite active at night though. started to feel more movements when we're in sydney and Ww to put his ear to try to hear anything...some movements and the heartbeat.